Search your deck for a [G] Energy card, reveal it, and put it into your hand. Shuffle your deck afterward. 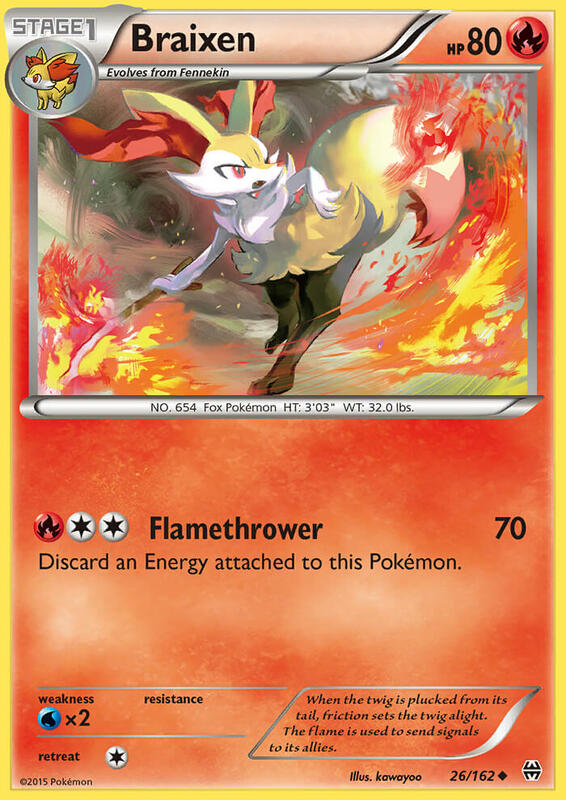 Discard an Energy card attached to this Pokémon and discard an Energy card attached to your opponent’s active Pokémon. Put 3 [W] Energy from your discard pile into your hand. If you and your opponent have the same number of Benched Pokémon, your opponent’s Active Pokémon is now Paralyzed. If your opponent’s Active Pokémon is [N] type, that Pokémon is now Paralyzed. Put 3 [G] Energy from your discard pile into your hand. Until the end of your next turn, each player can’t play any Supporter or Stadium cards from his or her hand. It can loose 100,000-volt bursts of electricity instantly downing foes several times its size. BREAK Evolution Rule: Raichu BREAK retains the attack, Abilities, Weakness, Resistance, and Retreat Cost of its previous Evolution. As often as you like during your turn (before your attack), you may attach a [L] Energy from your hand to 1 of your Pokémon. Discard an [L] Energy attached to this Pokémon. If any of your Pokémon were Knocked Out by damage from an opponent’s attack during his or her last turn, this attack does 80 more damage. It conceals itself in the mud of the seashore. Then it waits. When prey touch it, it delivers aa jolt of electricity. Your opponent’s Active Pokémon is now Poisoned. Place 1 damage counter on each of your opponent’s Benched Pokémon. If the opponent’s Active Pokémon has 3 or more damage counters on it, that Pokémon is Knocked Out. This attack does 30 more damage times the amount of Energy attached to both Active Pokémon. This attack’s damage isn’t affected by Weakness. Put 2 damage counters on your opponent’s Active Pokémon. If there is any Stadium card is in play, this Pokémon has no Retreat Cost. During your next turn, this Pokémon’s Returning Echo attack does 60 more damage (before applying Weakness and Resistance). During your next turn, this Pokémon’s Psych Up attack does 20 more damage (before applying Weakness and Resistance). If your opponent’s Active Pokémon is a Pokémon-EX, switch this Pokémon with 1 of your Benched Pokémon. BREAK Evolution Rule: Marowak BREAK retains the attack, Abilities, Weakness, Resistance, and Retreat Cost of its previous Evolution. Attach 2 [F] Energy cards from your discard pile to this Pokémon. Then, switch this Pokémon with 1 of your Benched Pokémon. If this Pokémon has any [P] Energy attached to it, this attack does 50 more damage. This attack does 30 more damage for each of your opponent’s Benched Pokémon. BREAK Evolution Rule: Zoroark BREAK retains the attack, Abilities, Weakness, Resistance, and Retreat Cost of its previous Evolution. Choose 1 of your opponent’s Active Pokémon’s attack and use it as this attack. Put 3 damage counters on each of your opponent’s Pokémon that already has damage counters on it. Each of your Pokémon’s attacks cost [Y] less. BREAK Evolution Rule: Florges BREAK retains the attack, Abilities, Weakness, Resistance, and Retreat Cost of its previous Evolution. Once during your turn (before your attack), you may heal 30 damage and remove a Special Condition from your Active Pokémon. Your opponent’s Active Pokémon is now Confused. Put 6 damage counters instead of 3 on that Pokémon for this Special Condition. As long as this Haxorus is your Active Pokémon, each of its attacks does 100 more damage (before applying Weakness and Resistance). You can’t add more than 100 damage in this way. BREAK Evolution Rule: Noivern BREAK retains the attack, Abilities, Weakness, Resistance, and Retreat Cost of its previous Evolution. Any damage done to this Pokémon is reduced by 30 (after applying Weakness and Resistance). It always stand on one foot. It changes feet so fast, the movement can rarely be seen.